Zombie Apocalypse launched onto the Xbox Live Marketplace back in 2009 and was met with critical praise from zombie lovers everywhere but mostly panned by critics because of how lacking it was in certain areas. Well with the game shifting enough copies to warrant a sequel, Konami have seen to it that Backbone Entertainment take over the reigns from Nihilistic Software on development duties and see if they can add in some extra flair that will make the game all that more better. 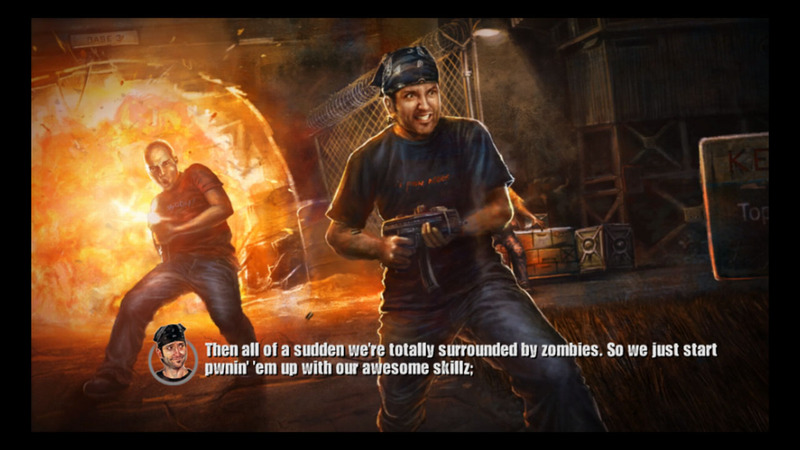 So how does Zombie Apocalypse 2: Never Die Alone match up to its predecessor? Is it a worthy entry into the Zombie Apocalypse franchise, and does it help spark the light that will bring on many sequels to come? Or does this new take on the series make it wish it had stayed dead and buried never to see the night sky again? Only way you�re going to find out is if you read our in depth review. If you ever played the first Zombie Apocalypse game then you will roughly know what to expect from this, the premise basically remains the same you shoot zombies you try to survive and earn as many points as possible but most importantly you work as a team. Like the previous game, this one supports up to four players on both local and online co-op or if you prefer to play alone then that is fine as well, the other characters will be simply replaced with bots to help you along the way. Unlike the previous game though where you were placed in an arena type of venue where you had to take on hordes and hordes of undead, this game now actually features somewhat of a story or premise as to what you�re supposed to be playing towards achieving. The main games campaign is broke down into ten separate campaign missions, each of which is slightly different to the other and they will always contain a different task or special infected for you to go up against. This means that the game never lacks any real creativity and also provides stopping the players from getting bored whilst going through the different scenarios. The biggest change in how the game actually plays out though is that instead of being placed in that arena type environment I touched upon a few paragraphs back, in this game you will find you and your team roaming the streets killing all of the undead that get in your way. Along the way you may come across helpless survivors that you can literally approach and slap back into action so that they follow you. Meet the guy who will no doubt steal the show all on his own! Whilst roaming through the streets getting from point a to point b whilst also rescuing survivors may sound like fun, it would eventually end up getting tiresome if you was doing that for ten different missions, so if you were a fan of the original arena missions you will be glad to know that they actually do make a return this time around, but they only play a backseat role into how the game plays. Some missions will just require you to sit in a specific area and hold out until the mission ends. With this teamwork will play a big key role to surviving the levels especially with the later levels of the campaign where you will get inundated with zombies. If you simply don�t work together or use your special abilities when you need to you�re not going to get very far in the game. I recently touched just on using special abilities and these come from each of the different characters that are available in the game. Each character comes with their own unique weapon which will vary the fire power dramatically, not only this though but your specific character will come with two types of special attack or ability if you will. The first special attack that your character as comes in the form of something the game likes to call the Pwnage ability. This simply put activates a modifier on your character which will either give them a strength boost or will have some other function that will not only help you out, but will also help the rest of your team in victory. If that�s not enough for you though, the game also comes with an rpg upgrade system, whilst you play along and use certain items you will notice how the game will point out that for instance your speed as been increased or your weapon proficiency as gone up a level. If you get that message then at the end of each level any money that you have collected whilst slaying zombies can be used to purchase those upgrades that you had unlocked. The game also comes with various mash up weapons that can be found on certain areas of certain levels, these are heavy powered weapons that can only be used for a certain amount of time, when used these weapons will create huge devastation to the zombies that may be around at the time. Obviously to be classed as a decent zombie game nowadays publishers and developers both know you need more then one type of zombie for the player to strive to kill. 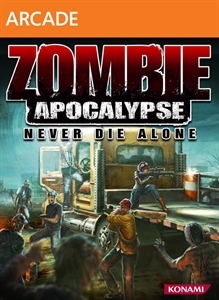 With Zombie Apocalypse Never Die Alone you will be more then glad to know that the game features many different variations of zombies plus special infected for you to put all of those unwanted bullets into. Some zombie types make a return from the previous instalment whilst others are entirely brand new. The game itself comes initially with just two modes single player and multiplayer, upon either completing any of these two modes you will then be met with two new game types that are classics from the first game. These come in the form of Blackout mode and Classic Mode. The two modes together help to sweeten the package all that more, but bringing classic mode back instead of making a new mode altogether left a sour taste in my mouth. This isn�t because I don�t like the mode, its just that In classic all you do is take on wave after wave of enemies and each wave you defeat classes as a day that you have won the war against the zombies. Thirty waves later and you will have beaten the mode, whilst it�s easy enough to do you will be more then bored by the time the tenth round starts up. All in all the changes that have been made to the gameplay in this sequel are amazing, its like Backbone took a look at the last game and listening to what feedback was being given about the game and worked from there to create this newer and much more improved version. With so many different ways to play the game even the average gamer will be spoilt for choice when it comes to slicing up those zombies. The graphics in Zombie Apocalypse 2 are nothing special, from what I believe they share the same graphics engine that the first game used and because of that the age of the game is starting to show. Environments look rather decent with lots of variation between different environments and set pieces that you can use to kill the zombies with. Explosions generally go off with a bang that will light up the field and if you get the chance to use Def Moneys secondary skill to bring the zombies to a halt then I strongly advise that you do, especially if you like disco lights. The character models themselves look rather cheap though, granted the game is a top down twin stick shooter at heart, but when the camera pans in close to the main characters you can see how blocky and poorly rendered they are. Still though to look at them from the view that the game operates in and when they are not covered in zombies or bullets, they do look decent from far out. A nice touch to the game is that even when your being swarmed by hundreds of zombies on screen at once, there is no noticeable slow down at all. You can just carry on shooting zombies, racking up kill and points and earning money without fearing of any issues with frame rate drops. Its great that the game as been optimized to support this as well as it as done. Cutscenes in the game come in the shape and form of almost comic book strip esc as they play out in single frames flipping from one to the next to tell another characters story, the cutscenes are really well made and the cartoon sketches show how in detail they wanted the players on screen to become, the only downside to all of this though is that there really isn�t that many cutscenes in the game to look at. It's at this point where you ask yourself, why didn't they just take the humvee? The sound in this game is borderline hit and miss, this is mainly down to the voice acting talent that is available though. It seems like Konami paid big bucks to get the Pure Pwnage crew onboard to provide voiceovers for the game, and whilst this all good the other three characters on display have terrible accents or just your average run of the mill voice actors that were probably most likely voiced by the developers themselves. Whilst some of the voice work is very laughable, its great to see that plenty of lines of dialogue went into creating the story that our survivors find themselves in, you have each character with their own separate background all looking to get to a single destination where they can be free. Then you have the voice of Jeremy who will make even the most straight faced gamer laugh aloud. In game voiceovers are pretty decent also, but the main problem with that area is that too much of the dialogue loops too often. You will be playing through some of the levels only to hear the same sayings over and over again which will soon become tiresome. Its not all about the voice work though, in game sounds such as shooting and explosions seem to hit the mark, even if the smg sounds do suffer from the same problem as the original game with that being they sound tinny. Zombies all have their own moans and groans like normal zombies do. Its great to hear them go splat though as they get tore up in a blender or electrocuted from a neon sign. Whilst more work could have been done in the sound department, it is great to listen to what is on offer, and as said earlier on you will no doubt get many giggles out of what each of the characters say, but that bad English accent needs to go. When you start to play Zombie Apocalypse 2, the game will be rather simple with zombies attacking you from various different angles and you just mowing them down and reaching the end of the levels. After a few levels though you will soon notice that the difficulty will severely ramp up as more and more zombies will start to cover the screen and even special infected will be there for you to deal with. You will most likely find yourself dying over and over again and with the co-op AI not being of much use you will find those dying off very quickly also unless you step in and take control. Whilst yes the difficulty is rather hard at times it does become more manageable over time when you start levelling up each of the different set of characters that you can choose between. The more you have used that character the more items you will be able to unlock and pay for and thus makes the game easier over time, with every upgrade you purchase another level campaign level will become more manageable as you go on. Yes this will mean though that you will find yourself grinding some of the earlier levels over and over until you have levelled up enough to start moving on. What makes this worse though is that if you do decide to play through on single player, be prepared to die a lot. As with the AI dying so frequently as it does and with how easy you can get downed at times, with no actual human players to help back you up your going to find that getting past even the third stage will take some doing. If you play in co-op either online or local though you will notice that things will become easier to handle as with every extra human controlled player, you can wave goodbye to one utterly useless AI. Difficulty whilst hard is rather satisfying and even when you die over and over again you will still keep coming back for more because you will just want to keep progressing and wanting to further yourself in this fun little game. If you were one of the lucky gamers to have played the first Zombie Apocalypse then you will surely know that the achievement list in that game was very much completable if you put in the time and the effort. 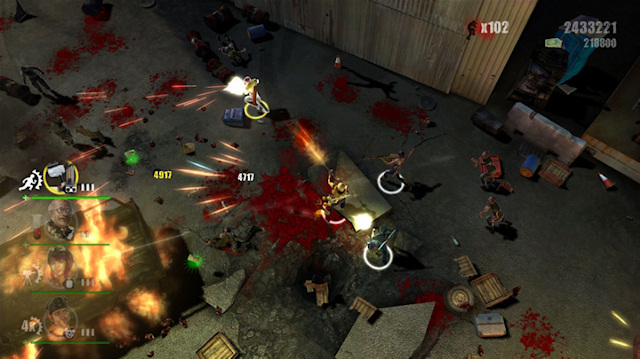 Zombie Apocalypse: Never Die Alone on the other hand is quite the opposite and features a mixture of both very easy and very hard or time consuming achievements that will help you keep coming back for more. Let�s start off with the easy achievements in the game such as the achievement for killing your first damned zombie in the campaign and for getting $20,000 in a single level. Both of these are really easy to do as you will come across your first damned zombie within the first few levels of the campaign mode. The $20,000 dollars will also come naturally as long as you keep looting the money all of the zombies drop whilst moving through the different levels. Moving swiftly onto some of the harder achievements though you have achievements for completing all of the objectives in a single level and then every level in the campaign, these will test anybody�s skills within the game as some of the challenges are on the rather tricky side of the spectrum. These are still doable though as you can play through a level multiple times until you fulfil the requirements. If you fancy doing certain things that you normally wouldn�t do within the game, you will be glad to know there are also a few oddball achievements thrown in for good measure. Take the achievement for using each characters pwnage ability ten times and rescuing a set number of survivors on the last level as the credits are rolling. These add that extra spice to the achievement design and make the player do something they normally wouldn�t do. Overall the list is solid and will provide many reasons for you to keep returning to the game just to earn those more elusive achievements that you may have missed the first time around, be warned though these achievements won�t come as quick nor as easy as the first games set. These are designed to make you stay with the game for the long haul. Handing over development reigns to Backbone Entertainment is the best choice Konami has made when it comes to Zombie Apocalypse 2. Every inch of the game is an improvement over the last game, and with that said if you were one of the many that enjoyed the first game you will no doubt love this game too. With the partnership with ROFLMAO productions onboard as well, you can be sure to get that silly slapstick humour that is well known within the Pure Pwnage universe and because of that the game is better for it. This could of easily have released at 1200 Microsoft Points, but at the low price of 800 there really isn�t any reason why you shouldn�t pick it up. If you�re looking for a good shooter that knows how to have a laugh and will last a considerable amount of time, this is the game for you.